Here’s a very nice and simple meal, ideal for summer, ideal to use vegetables from your own garden, and ideal to support your local fish monger (yes! 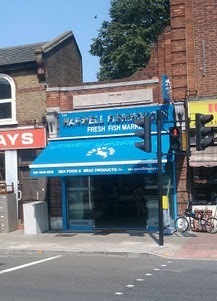 Hanwell now has its own fish monger, hurray! You can’t miss it; it’s straight across the road from the Rolls Royce dealership, 111 Uxbridge Road). Rummage through the garden. I found courgettes and cherry tomatoes. Cut the courgettes in chunks and fry them in a non-sticking pan â€“ no fat, no salt â€“ as hot as you dare to. Meanwhile, clean the King fish steaks. Bring a generous amount of olive oil to moderate heat, season with a large amount of crushed black pepper (at least one tablespoon), two crushed gloves of garlic, one hot chilly, and lots of fresh thyme. Gently fry the fish steaks from both sides, about 4 minutes each side depending on the thickness. While frying, spoon some of the juices and fat over the top of the fish steak. Toss your cherry tomatoes in with the courgettes, give them 5 minutes to heat but not to cook. Add a pinch of salt and and some fresh thyme, then remove from the heat. Swiss chard would also have been nice, or fresh artichokes. Next time. So, this is it. Remove the fish from the pan and plate out. Drizzle with lime juice and salt, add the steamed potatoes and some of the vegetables, and enjoy. We never had King Fish before, but I certainly plan to have it again. This entry was posted in Food and Drink and tagged cooking, Ealing, Fish, food, hanwell, recipe by w7. Bookmark the permalink. Pingback: Priceless Paintings from W7 » Something Fishy Tonight!